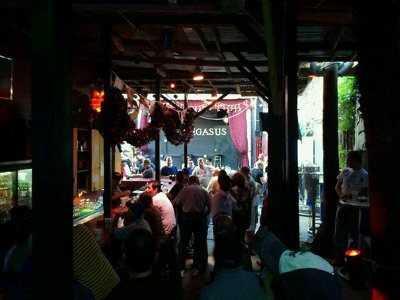 Pegasus Nightclub is a large establishment in San Antonio that houses four venues: a karaoke bar, a video bar, a leather bar, and a country bar. No one is left out once you set foot in this club. They are practically giving the alcohol away here with how insane their drink specials are. The "Peg" as the locals call it, is open 7 days a week and there is NEVER a cover charge. Happy hour is every day from 2pm to 9pm. If you are free on a Sunday there are $1.50 domestics and once it hits 5pm all it takes is two quarters for a tasty draft. The Pegasus knows how to get down and dirty and isn't afraid to share.